Wedding announcements share the news of your marriage with individuals who were not invited to the wedding. Many couples send announcements to distant friends and relatives who could not be invited due to wedding budget limitations, time, or the type of wedding ceremony. It is unnecessary to send announcements to guests who were invited to the wedding but responded that they were unable to attend. Mr. and Mrs. Bride's Parents are pleased to announce the marriage of their daughter, Bride, to Groom, son of Mr. and Mrs. Groom's Parents, on Wedding Date at Wedding Location. A celebratory reception is planned for Reception Date at Reception Location. Bride's Mom and Bride's Dad are pleased to announce that Bride and Groom went away for vacation and got married in a tropical destination! Bride and Groom were married on Wedding Date at Wedding Location. We hope to celebrate with you on Reception Date at Reception Location. Bride and Groom are pleased to announce their marriage on Wedding Date at Wedding Location. A private reception was held at Reception Location immediately following the ceremony. The couple's new address is Home Address. Two hearts became one and it's time to have fun! Bride and Groom were married on Wedding Date at Wedding Location! We then danced the night away in a private reception at Reception Location. Our new address is Home Address. We did it! Bride and Groom were married on Wedding Date at Wedding Location. Please join us to celebrate with a barbeque on Reception Date at Reception Location. An elopement wedding announcement contains the same information as a traditional wedding announcement. However, elopement announcements also clearly identify the event as an elopement to indicate that no guests were omitted from the guest list for any reason. Bride's Mom and Bride's Dad are pleased to announce that Bride and Groom eloped on Wedding Date at Wedding Location. The couple has settled at home at New Home Address. Bride's Mom and Bride's Dad invite you to a reception at Reception Location on Reception Date. In a private ceremony, new love was celebrated. Bride and Groom eloped on Wedding Date at Wedding Location. We love each other a lot and we finally tied the knot! Bride and Groom eloped on Wedding Date at Wedding Location. We look forward to seeing you at our reception, to be held on Reception Date at Reception Location. Names: Both the bride and groom's full names should be included so that the recipient can be sure they know who the announcement is regarding. This is particularly true for recipients who do not know both the bride and groom. Wedding Date: Sharing the date of the wedding lets every recipient know the special date and what will be the date of many happy anniversaries. It should also be very clear that this date is in the past so there can be no confusion about whether this is an invitation or an announcement. Wedding Location: The exact address of the wedding is not necessary, but many couples will include the city and state of the ceremony, or the name of the location such as a specific resort or church. 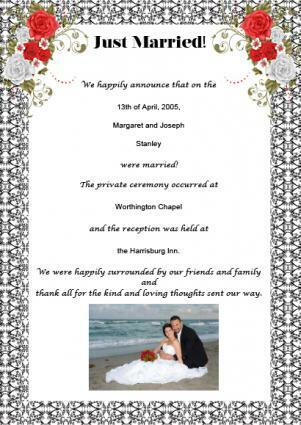 This provides more information about the wedding, to let recipients know a little more about the event. Reception Location: If a reception has not yet occurred, a wedding or elopement announcement can be used to share the date, time, and location of the upcoming reception. Note that since it serves as an invitation to a reception, you should only include and send this information to recipients you intend to invite. Wedding announcements allow you to share your nuptial news with distant friends and relatives. They should generally be sent as soon as possible after the wedding. Announcements can be mailed as soon as the day of the wedding and up to a few weeks after the event.